In the mystery genre, it is the detective who is the moral compass for the audience. The detective thunders away at those who work tirelessly to protect their own vile secrets. And once the great gumshoe grabs hold of everyone and explains how conclusions are met, a final denouement is served and justice prevails. This is what makes “An Inspector Calls,” the classic J.B. Priestley play now being performed at Stanford Repertory Theater, such an enigma. What we believe about the virtuous Inspector Goole when we first meet him is not what we believe later. What are his motivations? How does he get this saucy family to admit secrets that are so appalling and loathsome? Goole moves around the room with magnificent subtlety, eyeing each suspect with murderous intent, calculating everything he does, even rearranging glasses with gentle, yet fierce purpose. One of the best pieces of Stanford’s production is the razor-sharp detail by director Rush Rehm, enhanced on Erik Flatmo’s precise set. The movement of his staging reeks of pretention, with noses turned up as though a puppeteer is hovering over them with a string. When you first meet the family, just seconds after the lights come up on the stage, they are engaging in the most obnoxious, narcissistic laughter, the kind that that reminds the audience that we are missing out on all that privilege. 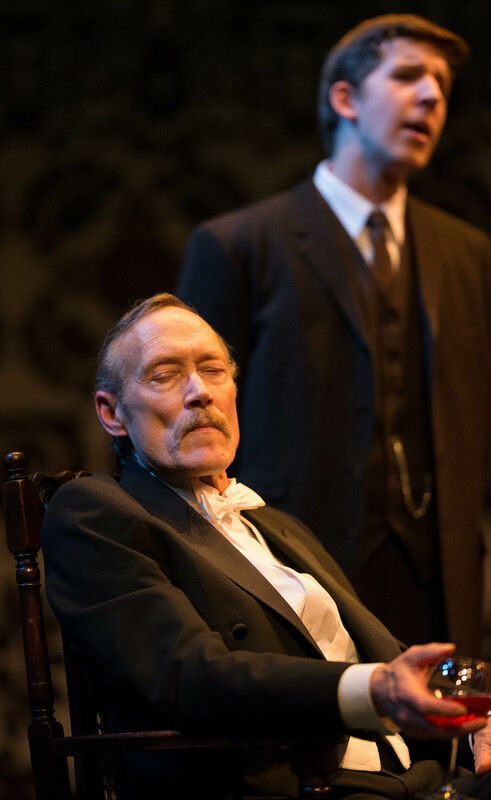 The game changes in a huge way when the curious Inspector Goole (A sharp, precise turn by Weston Gaylord) enters the scene. Suspect by suspect, he is able to get each to admit a dirty little secret, showing them each a mysterious photograph of the lovely Eva Smith, who committed suicide by drinking a strong disinfectant. The secrets range from an unjust firing to a torrid affair, an affair that threatens the wedding of Sheila and Gerald. 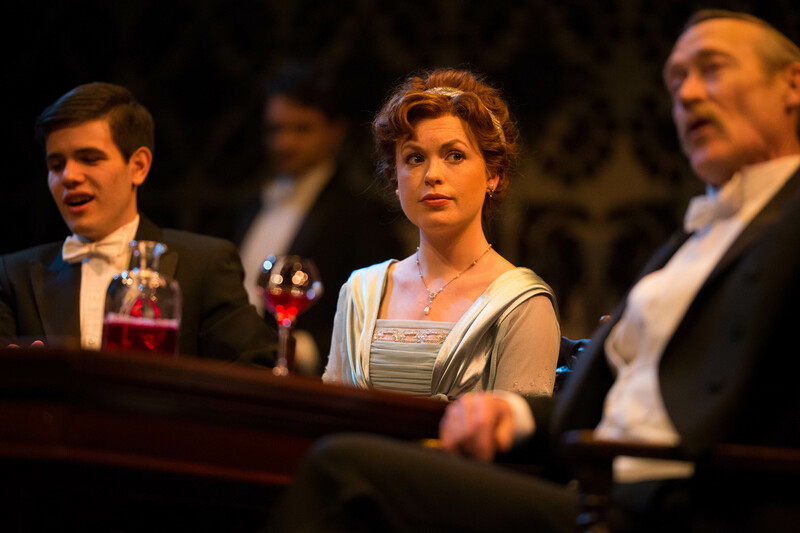 Where this play finds its legs is in the committed performances of its principal characters. While James Carpenter is solid in just about everything I’ve seen him in, the freshness of his counterparts provided for some wonderful sparks. Whether it was some cantankerous drivel by matriarch Sybil Birling (a splendid Courtney Walsh) or fuming fireworks between Gaylord and his co-actors, Rehm’s cast did a magnificent job of listening and reacting, listening and reacting. Those moments kept a fresh, organic feel permeating through most of the scenes. Gaylord and Bagger were particularly strong, with vociferous, yet subtle choices being made consistently at every turn. Despite some slow moving exposition at the beginning of the play, Priestley’s work has such a keen finger on the pulse of his subjects. Throughout each transition from one moment to the next, we see Goole’s subjects at various times dealing with different emotions – anger, frustration, sadness, resignation. Yet, once certain resolutions are brought to the forefront, nothing changes for them. Their concern is never for the tragedy that befalls a young girl, but for the fact that their time sitting around their dinner table, laughing with feigned joy may be coming to a close. There is so much discussion in today’s toxic political discourse that revolves around wealth – who gets it, who deserves it and who is entitled to it. One of the great tragedies of Priestley’s play speaks to the cautionary tale on the moral compromise of wealth. The Birling family may have wealth and status, but the one thing they sorely lack is a collection of souls. Despite their outward status of financial privilege, on the inside, this family is clearly bankrupt. The Word: Sharp, precise performances and sure-handed direction come through in this solid morality tale. For tickets, visit Stanford’s Theater and Performance Studies official website.